Dogs are fun but if you can have K-9 from Doctor Who then why would you go for a real dog. Now you can have your own K-9 and this one is soft in cuddly because it is a plush based on the real K-9 from the Doctor. 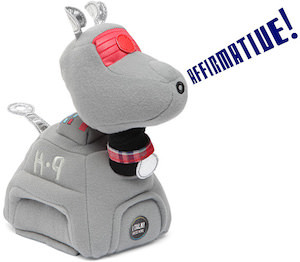 This plush K-9 is about 8 inch tall and 7 inch wide and can say things like Maximum defines mode!, Affirmative, and Master?. Just imagine having this robot dog around while you just want to cuddle and watch Doctor Who on TV. The nice thing about this Doctor Who plush dog is that you don’t have to walk it or clean up after it. Just play and enjoy that is all that the K-9 plush wants. 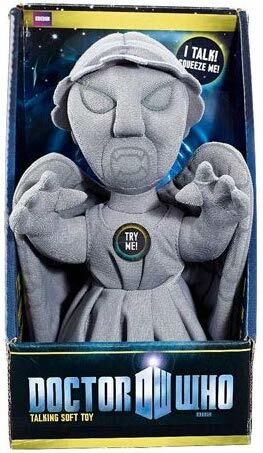 Get a plush pet in your family and I would start with this Doctor Who K-9 Talking Plush.